Pastor David asked each of the staff here at St. John Lutheran Church to write on a broad topic: what our job entails, what we appreciate about St. John or anything close to that. First and foremost, I appreciate the people I get to work with on a day-to-day basis and those that pop in the office, however frequent. I appreciate and enjoy the work that I get to perform; that being creating the weekly bulletins, announcements and other church media. Plus, assisting people in need, be it with food, help with rent or a utility bill or an ear just to listen. I like that each day there is something new and different. But the “bestest” part of being here at St. John each day is that I get to experience the Sanctuary in a totally different way than I do during a worship service. I get to really feel the quiet, the calm, see the beauty, and experience the silence at its best. For me I feel God entering my heart when I am able to be in the silence. In our daily lives each of us has so many things to deal with, deadlines, phone calls, children, spouses, friends, family; the entire daily routine. When I am in the Sanctuary all the hub-bub of life stops for me, and for a moment I can simply be. I know some of you have the ability to make your own moment of silence in your daily routine while others, like me, can seem to do it. I am thankful that I have that experience so close at hand. I invite you to stop at church during your daily routine and experience the silence too. You too are invited to write a blog about faith and life. If you are interested contact Pastor David. For some, words come easy. For me, it is harder to express myself. For a little over 25 years I have typewritten other people’s thoughts in the form of minutes. My purpose has been to say what other people meant – not so much what I think. One thing that usually comes from my thoughts is asking others to describe how the “money is spent” – mostly so I can ascribe the amounts to the correct budget item. It is a bit of a bother for them because they have ministry on their minds. Oh, don’t get me wrong – we have a very conscientious staff – all very trustworthy – but nonetheless we have many ways to be accountable. I am honored to serve amongst the staff at St. John. There is much that is accomplished in the name of God the Father, Jesus the Son the Redeemer, and Holy Spirit the Sanctifier of our faith. There is one area of ministry that I was instrumental in starting. Our pastors have always had a heart for people who come to St. John for assistance and often shared personal money (and still do on occasion) to help people through rough patches in their lives. In 1988 I experienced a number of those types of requests. In 1989 after my heart had been broken so often by sending people away because a pastor was not in the office at their time of need I was visiting with someone about this and they explained how a church they were involved with had a ministry that addressed such needs. They called it the Bags of Groceries Ministry and they had volunteers who would fill a bag with basic items to feed a family of four for two days. The bag was designed to fill emergency food needs. That person, who still wishes to remain anonymous, gave the “list of items in a standard bag” and $1200 toward the start of this ministry at St. John. The council approved, and the ministry began. Many of you have supported this ministry over the years. One anonymous person has supplied certificates for milk and eggs and many others have given offerings. The Sunday school has decided to support the ministry by decorating brown paper grocery bags at Christmas and many of you shopped to fill these bags. This past Christmas you filled 46 bags. Others donated turkeys at Thanksgiving – some have sponsored these Thanksgiving dinners. We gave out 24 Thanksgiving dinners in 2013 and many additional turkeys. There is a wonderful amount of food distributed from Kwik Trip since we partnered with them last July. And then in December we received word that Kwik Trip had donated $367.00 toward our Second Harvest order. In addition many have signed up for the “Million Pound Challenge” and so far we have received enough to shop for a month without charge. All of this requires a great deal of time and commitment from a large number of people. A couple of weeks ago, Linda handed out 37 bags of groceries in a week and a half. It was the time when property taxes were due, and Christmas bills had come due and heating costs had escalated so greatly! The information contains nothing about the Good Samaritan Fund to help with rent, medications, and utilities, that has also been established here at St. John. Some have heard this story before; for some it is new. For me it has been an ongoing part of the ministry of St. John ever since I started working in here in 1988. I invite you to join us at Noon or starting at 5:30 for Soup Bread and Pie. These are wonderful opportunities for intentional fellowship! Worship services begin at 12:30 (a brief service) and 7:00 (Holden Evening Prayer). Join us! Today's Lenten reflection will focus on John 9:5 and Jesus' statement that he is the Light of the World. What is light and what is dark in your life? What does it mean that for you that Jesus is the Light of the world? Where has the light of Christ shown most brightly in your life so far? What difference does Jesus as the light shining in this world make to you and those around you? Come hear Pastor Dom as he reflects on this passage today. Its a Monday. I often wish we had two Mondays because there is always too much to get accomplished, and too many good conversations to have. Maybe that is why Mondays have such a bad reputation, there is just too much for one day to hold! One of the things I love about Mondays here at St. John is that for a short time, people are so busy getting stuff done, they tend to leave me alone! So I can do things like write, and organize my desk. But as you will note by the infrequency of my writing on this blog, and the state of my desk... that time is short lived. Don't get me wrong I am not whining... by no means, it just is the way it goes. In this season of Lent it is easy to get swept up in the business of day to day life and forget those disciplines of Lent we fully intended to follow. If you are still going great guns on them, wonderful, but if you like me stumble and bumble a bit, fear not! The Gospel acclimation we use during Lent goes this way... "Return to the Lord your God, for he is gracious and merciful, slow to anger and abounding in steadfast love." Maybe we need to sing this more on Mondays than Sundays! No matter when you sing it, it is a good reminder that as we repent, as we continue our move toward the cross, and the tomb, God is there for us. Today we kick off our midweek Lenten sermon series. 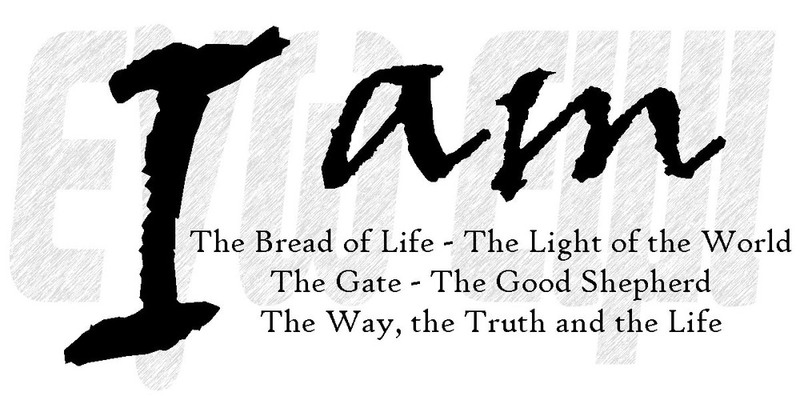 We will focus on the "I Am" statements that Jesus makes in John's Gospel. We will carry these themes into Holy Week as well. This time together is part of what makes Lent very special for me. The pace is slower, more reflective and I often get the chance to really talk with folks. Sunday mornings can be a bit hustle and bustle with all that goes on in and around St. John not to mention trying to get out the door quickly to get a prime seat at Greenwoods. When I was a kid I never liked leaving home to go these services. It always seemed like such a pain and inevitably I missed one of my favorite TV shows, and we didn't have a VCR much less Tivo back them! Today I wouldn't trade them for the world, there is just something about these 40 days. Well I hear folks gathering downstairs... its time!